Babette, Bärbel's long lost and secret older sister? Babette bindet Bücher (Babette Binds Books) arrived early last week and provided a wonderful deja-vue experience. The 1953 story (Bärbel) was an almost identical word-for-word reprint with the same characters, but with a different illustrator (Lotte Oldenburg) than the 1935 story (Babette). Babette did however provide some differences that were interesting. 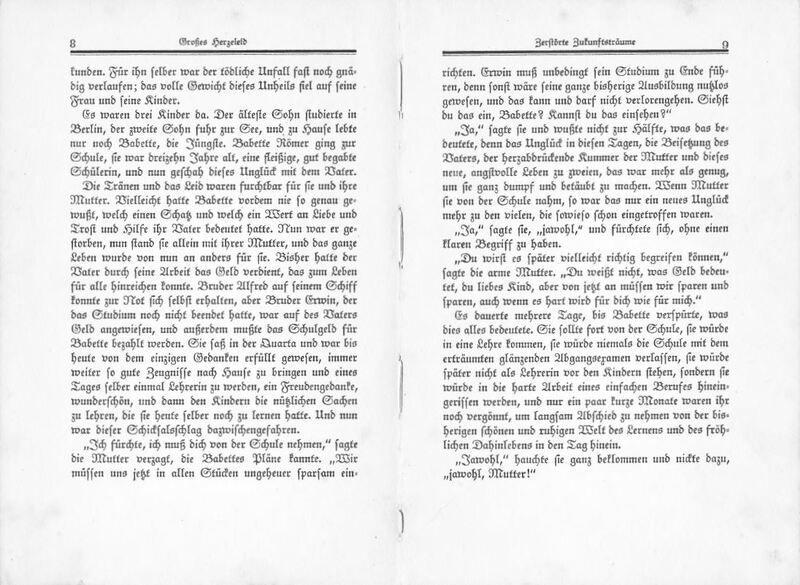 The first was the choice of typeface in the 1935 story, an appropriately German fraktur. Makes for an interesting combination with the typefaces used on the cover... I did look through my Buchbinderlehrling to see if the book might have been reviewed or at least mentioned, but alas, no. 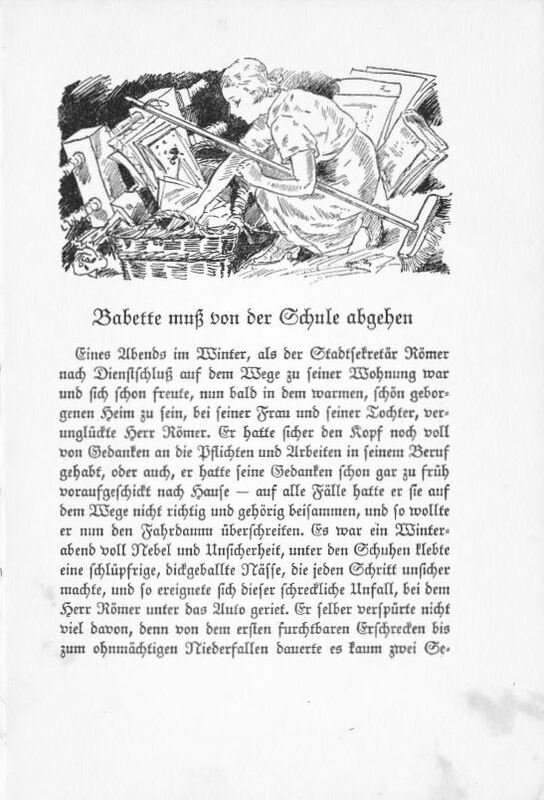 Babette was described in Georg Ruppelt's Buchmenschen in Büchern (Book People in Books), 1997, accompanied by the frontispiece illustration. 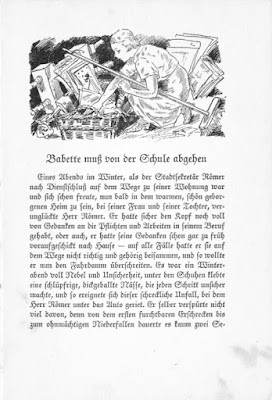 The frontispiece and title page below show Babette in workshop with Meister Schwannecke and depict her as a the book-lover she is. Babette cleaning the store room in her first days as an apprentice. Babette muß in ihren ersten Lehrtagen den Lagerraum aufräumen. Babette's mother spoke strongly about these consequences and the impact that they would have. Babette answered with "jawohl" and "jawohl Mutter...," I.e. "yes, ma'am! A good obedient child who knows her duties and responsibilities. The story itself is told very unpolitically, although duty and obedience (Pflicht und Gehorsam) could be interpreted that way, and probably should be in the context of 1935 when everything was politicized, including trades and education. 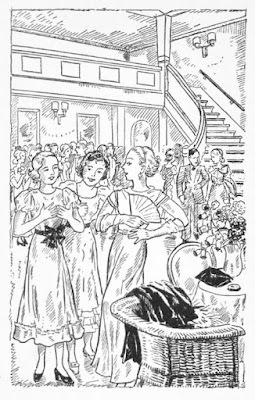 After this the story continues identically with only very minor variations for both Babette and Bärbel. 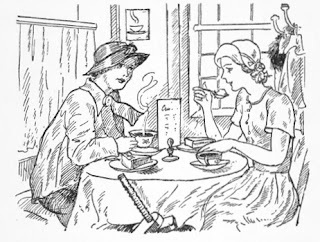 Coffee with her former teacher, note press under table. Kaffee mit ihrer ehemaligen Lehrerin. Die Presse ist unter dem Tisch. The cranky Journeyman's pants are glued to the stool as a prank, and torn out. Die Hose des fiesen Gesellen wird vom Lehrling an den Hocker geklebt. Nach gelungenem Scherz muß Letzterer eine neue Hose holen. 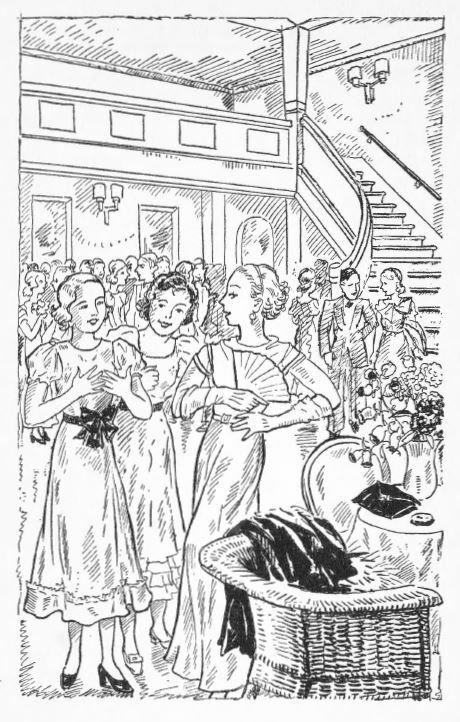 Bärbels fröhliche Lehrzeit (Bärbel's Happy Apprenticeship) by Felix Riemkasten written in 1953 is a charming piece of teen lit. for women. 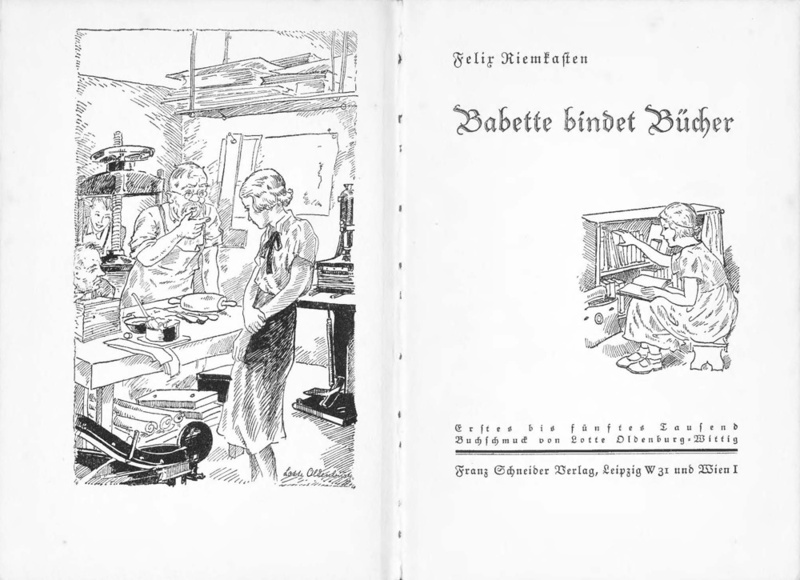 Illustrations by Christa W. Gräfin von der Schulenburg. After the death of her father, Bärbel, at age 14, needs to leave school to take up an apprenticeship rather than going on to university like her eldest brother (She was a straight A student). She loves books, bookbinding isn't too strenuous (says her mother), ... What could go wrong? 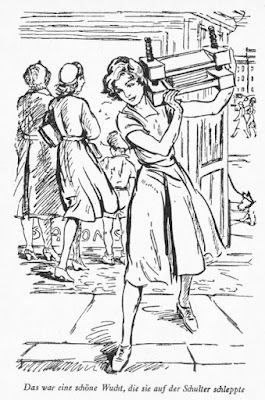 Nothing actually, mostly, and after finding an apprenticeship her first task is cleaning the store room (very familiar to me). Then there are challenges in dealing with the Altgeselle (Journeyman who never moved on to become a master), being the only woman, ... However, she's an ambitious over-achiever, pushes herself to learn new things, wants to create fine bindings and open new markets... A fun read that is remarkably accurate in its portrayal of many of the realities of apprenticeship, its descriptions of tools and equipment, and is up-beat, cheerful, and even empowering. Bärbel pointing out some of her bindings in a book store window. Although Germany had been relatively "progressive" about women as apprentices..., Bärbel was the first woman to apprentice with Buchbindermeister Schwannecke. 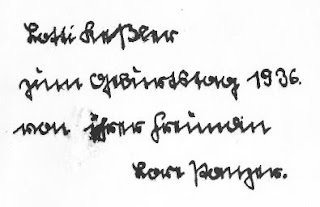 All apprentices were referred to as "Junge" (boy), and Bärbel was also referred to as this... Bärbel's gender was also something that led to regular disputes with the Altgeselle, a journeyman who never progressed beyond that stage and was largely responsible for the day-to-day work and apprentices. 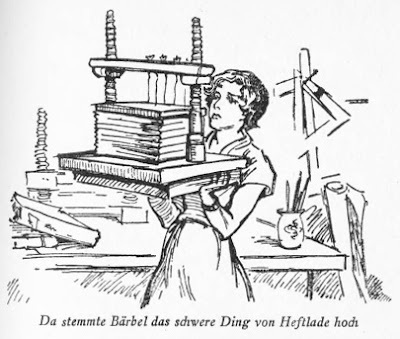 As woman, Bärbel was naturally weaker, something of a liability in a trade that required great stamina working while standing and carrying heavy loads... 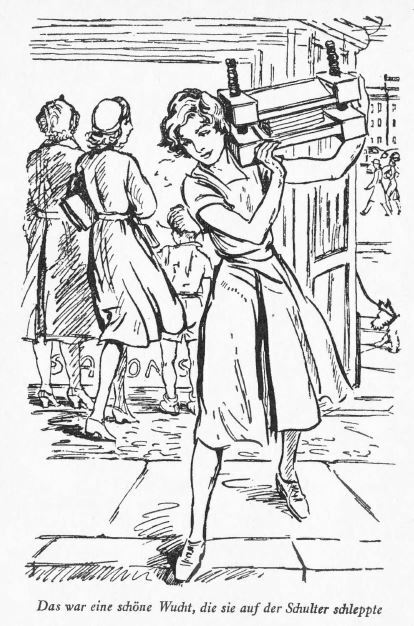 Hence, carrying the loaded sewing frame on her first day... Of course, she first had to identify the sewing frame never having seen one...The number and size (as well as dangerous) of the equipment and tools also intimidated her. Among the adjustments was also that learning a trade as an apprentice was not a warm and fuzzy environment filled with mutual respect... Praise was scant, even when the work was well done, and apprentices (and journeymen) were chastised in the presence of others. 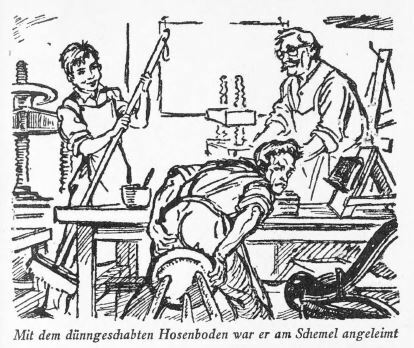 As part of her apprenticeship, Bärbel also had to go to trade school - the great equalizer where apprentices learned those things they might not learn in the shop... This was an experience she enjoyed, in large part because it was not the "bunker" her shop was. Wrapped up in her ongoing conflict with the Journeyman was also the realization that it was very important to set personal goals for oneself, and that not to do so was to hold oneself back. For her, this meant going beyond mastering just the day-to-day skills, but taking it to the next level. 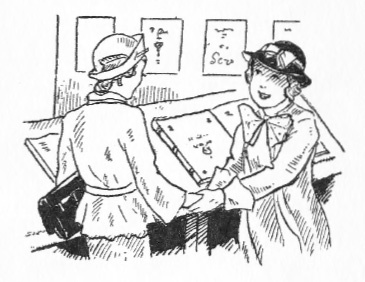 The book also did a good job of describing the types of jobs that came in, from repairing textbooks, to binding ledgers for businesses, to journals for libraries, ... This was the kind of work that sustained small trade binderies, and subsidized the more demanding work. It was also the kind of work that "allowed" apprentices to develop chops via rote memorization (of mind and hands), not her favorite. Via a conservation with another apprentice, she learns about his motivation for stealing, with his eyes, picking up tricks and new techniques. Bärbel is his favorite for this as she does the most beautiful work. In terms of techniques, one of the best descriptions is for when Bärbel learns about decorated papers, and how to make and apply these. For her, this is also when she realizes even more what the design possibilities can be, and how to set her work apart. In some respects it felt the Bibliophile listening to the Master in Ernst Collin's Pressbengel (Bone Folder). Newly minted as a journeyman binder, Bärbel seeks out venues for showing her work, and perhaps earning some extra income. A local bookstore is more than happy to display her work in their shop window, also indicating that customers can contact her via the store. Ironically, she has very little success in attracting work. She does gain a patron of sorts in her brother who was at university and is now doing well, binding books for him (and his friends...). This eventually catches the attention of the (now other) journeyman who rats her out to the Meister. Without her Meister and the license to run her own shop she cannot legally do this kind of work on the side. However, after reprimanding her more for using shop resources without permission and compensation, he senses opportunities for his business and adds Kunstbuchinderei to his name. This gives him more prestige, and with Bärbel's skills that he acknowledges are more refined than his, a broader pallet of services. 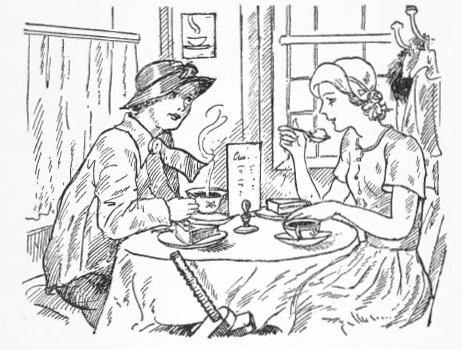 The other Journeyman gets reproached for being a busy-body, and further when learning that she is earning more than him, and as a girl no less, plans for further revenge. This back fires, or as is said in German "geht in die Hose" (went to his pants), literally. Bärbel, meanwhile, continues to be allowed to borrow equipment, and is quite happy with the situation. 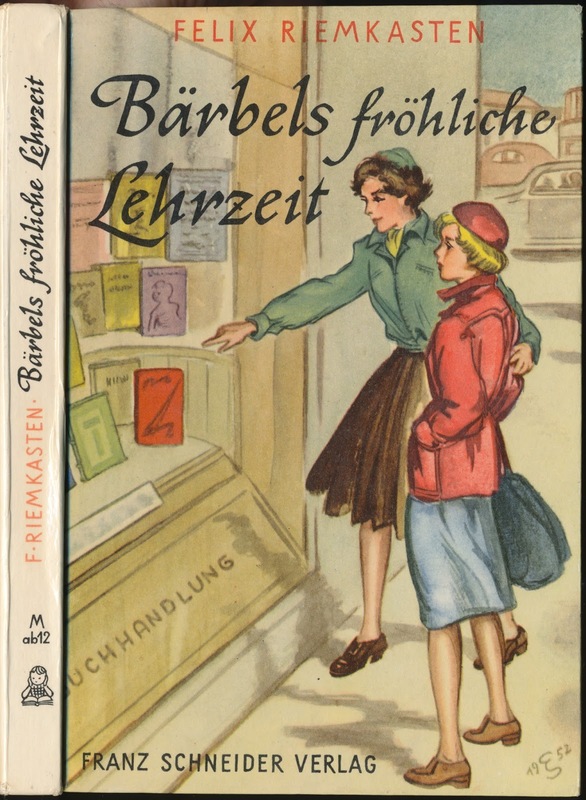 Finally getting a binding job via the book store, she gets to know a Frau Director Feld, a woman who is very successful and independent in her life. 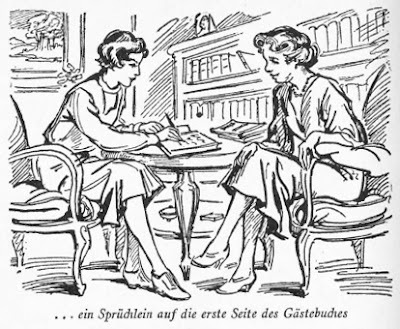 This Frau Feld becomes her patron in the classic sense, giving her commissions, discussing bookbinding with the interest of Collin's Bibliophile, but even more. Asking her to leave her portfolio of designs, materials, and decorated papers, she shows these to like-minded friends, but also arranges a tea in her home where Bärbel gets to meet these friends and give her pitch. While very surprised by this scenario, she is very prepared, poised, and confident. Bärbel confidently and enthusiastically at work. One of the guests mentions an upcoming competition for a new guest book for the city (every village, town, city, ... had one). 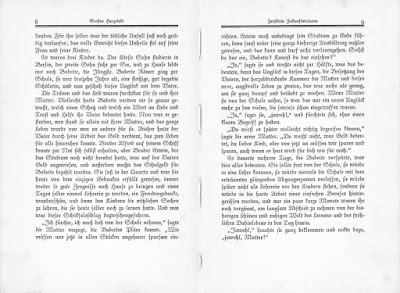 Open to all, Bärbel enters a design finely executed on a sample binding. 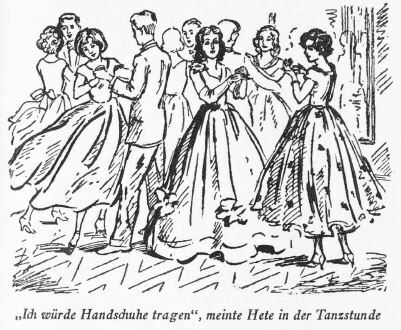 She is heart-broken to learn that she did not win having been beaten by established artists, and is told by Frau Feld that the gentleman who encouraged her to enter was doing so largely in jest – she was still very young and inexperienced, and the winners were established and highly respected artists. She did, however, come in fourth and her work was exhibited with the winners, a consolation. 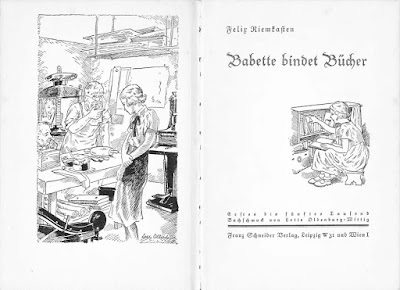 Her Meister was appropriately proud, and wanted her to remain with him to do the higher end work that she had been bringing to the bindery – who would do it if she left... Frau Feld had other ideas however and had been busy networking to find Bärbel a position in a large trade bindery where she would work in the extra binding department. 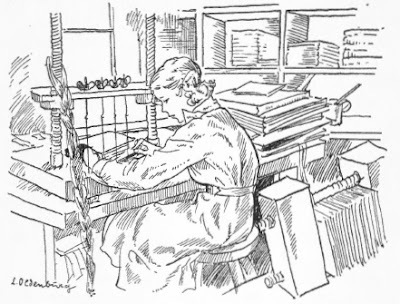 Having worked in the same bindery for her apprenticeship and journeyman years, she had very limited perspectives and alternative experiences. Moving on would be very important for her professional development, something the Meister also realized. The [binding] world was hers for the taking, and with her drive, passion, and the help of patrons and mentors she would succeed. Bärbel dedicating a guest book she bound to her patron. So, from this 54 yr curmudgeon, a fun read loaded with accurate descriptions of the trade and apprenticeship in general, positive and encouraging, and with the complications of teen love and its associated drama. 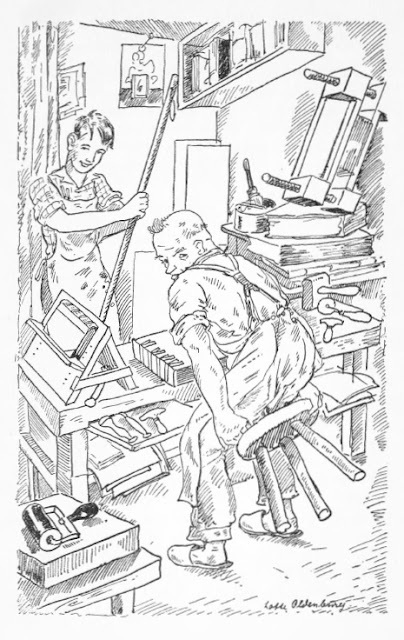 Based on my personal experiences as an apprentice in Germany during the 1980s, I found the portrayal of the Meister and his relationships with the others fair and largely accurate - apprenticeship is not summer camp, management style ranging from brusque to encouraging, what we would expect in the traditional trades. For someone like Bärbel who was academically strong and would have gone on to university, the contrast would have been stark and revealed crass differences in class and educational background, as well. Throughout though, Bärbel and the Meister handled themselves and each other well, and the real antagonisms were expressed through the journeyman who never showed any drive or enthusiasm, but was jealous of those who did. Ultimately his behaviour had him strongly reprimanded – shape up or ship out – and he and Bärbel came to an understanding. Finally, there was Frau Feld, a successful and cultured woman whose strong support (and some enabling) opened many doors for Bärbel, doors that she walked through with confidence to close the deals that Frau Feld had started. Thinking that this book might have been reviewed, or at least mentioned, in Das Falzbein, THE journal for bookbinding apprentices I leafed through my complete run page-by-page starting in 1952. Alas, nothing, disappointing because I think the book could have encouraged readers to at least consider our craft. 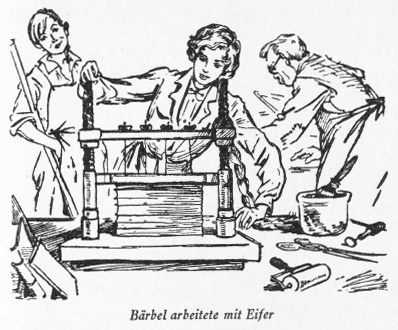 I did, however, find numerous images of female apprentices and art school students who could have been models for Bärbel. So anything like this appear in English or another language? 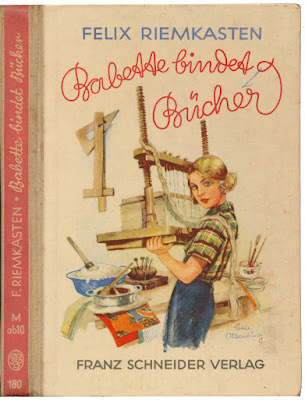 See also my post about Babette, Bärbel's long lost and secret older sister?, aka Babette bindet Bücher.